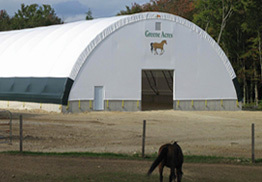 ClearSpan creates the premier equipment storage buildings. Equipment is a costly investment for businesses, and it requires a dependable structure that can provide year-round protection and move with your jobsite. ClearSpan equipment storage buildings are a durable and dependable option that protects and simplifies storage, while having the ability to move with your jobsite. Our buildings provide protection from rain, snow, heavy winds, freezing conditions and more, and the natural ventilation featured in our buildings ensures that moisture and condensation don’t accumulate. ClearSpan equipment storage structures have plenty of clearance and no support columns, so equipment can be conveniently stored and easily accessed. ClearSpan creates the ultimate equipment storage solutions for oil and gas companies, and whether your storage need is big or small, permanent or mobile, there is a ClearSpan building. 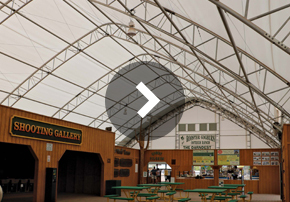 Our equipment storage buildings come in fabric, hybrid and metal buildings, ensuring that no matter how you plan on using your ClearSpan structure, there is an ideal option. Click on the building profiles to view application pictures and more building sizes.